The sewer drain line is the main drainage piping starting two feet outside the outer foundation wall of the structure to the sanitary sewer main. If you know where your sewer drain clean out is, you're ahead of the game. If you don't know, then it's time for you to find out. Normally it will be located on the lateral line (between the home and the sewer main) about one to two feet away from the house. Check for standing water in the clean out by removing the cap. If you don't find any water, the backup is somewhere between the clean out and the house, and must be dealt with by you. 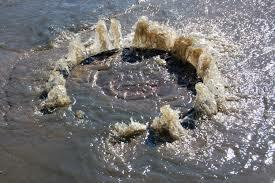 Should the clean out be full, the stoppage is likely in the city main sewer line - contact us immediately for repair.